Full disclosure, I was provided an advanced copy of this book by the author however I have voluntarily chosen to write a review. All opinions are my own. 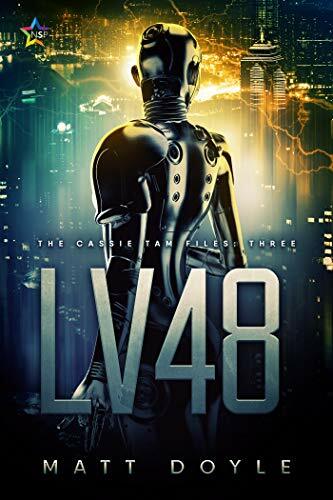 LV 48 is the third of the Cassie Tam files by author Matt Doyle and follows the cases of Chinese-Canadian private investigator Cassandra Tam. Picking up shortly after the close of The Fox, The Dog and The King, life for Cassie has settled down a bit and she manages to get an evening out with her girlfriend, Lori. But when a quiet evening out turns into a harrowing encounter with a mysterious creature, Cassie realizes that there will be no rest for her. Upon finding out that she has become the latest in a series of bizarre “blood muggings”, Cassie once again finds herself working with the cops in order to track what they have termed the “LV” or light vampire. Teamed up with the head of the Tech Shifter division, Cassie enters a dangerous game of cat and mouse with her most terrifying adversary to date. As the threads start to unravel and the mystery of the “light vampire” becomes clear, it comes as no surprise to Cassie that the motivation of the LV revolves around the criminal underground, but how deep do the tentacles go and how many more people will fall victim to these tech-enhanced nightmares before they are apprehended? With Cassie’s third case closed, we see a return to the more tech-heavy Noir feel that we saw in “Addict”. The LV’s introduction as another player on the already bizarre field of New Hopeland’s inhabitants when you think about it really is a natural progression due to the availability of tech in the city. But with people having the ability to literally become whoever (or whatever) they want to become with the addition of a few prosthetics also comes the challenge of determining the motives and identity of the person within. Cassie once again finds herself relying on her contacts both within the police force and the criminal underground in order to crack the case. LV 48 is probably my favorite in the series thus far, but that’s not saying much because all the books in this series are excellent. With the case of the light vampire closed, Cassie can get back to normalcy; or can she? I cannot wait to see what Doyle and New Hopeland have in store for this P.I. when her next case comes knocking.